Defamation solicitor Yair Cohen has made a bit of history recently by being the first solicitor to obtain permission from a judge to serve an injunction on an unknown internet troll via Instagram, the popular photo-sharing social media platform. The harassment injunction was granted against the defendant to prevent harassment, defamation and the disclosure of private information, but without knowing the identity or address of the defendant. The student who had instructed Yair Cohen to obtain the injunction was allowed to remain anonymous and has been referred to in the proceedings only as DDF. The harassment injunction was obtained after unknown Instagram users threatened to publish false allegations against the student and to expose alleged intimate photographs. Yair Cohen, who is a partner at social media law firm Cohen Davis, sought a banning order before Mr Justice Nichols at the High Court of Justice in London. The judge agreed that a permanent injunction was likely to be obtained at trial both under the Protection from Harassment Act 1997 and against the additional release of private information. Even though the defendant was not present at the hearing and was not notified of it, the circumstances were such that it was just, convenient and appropriate that the banning order be granted, having considered the defendant’s human rights against the human rights of the student. As the messages included allegations of criminal conduct, to preserve the defendant's human rights, the order allowed him (or her) to not be prevented from repeating the allegations but only by attending a police station in person to make a formal complaint about the student. The judge warned though that making false allegations of criminal conduct can amount to a civil as well as to a criminal wrongdoing. 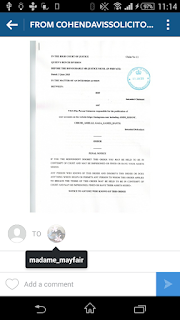 Yair Cohen, a defamation solicitor from London who has so far created a number of legal precedents in online defamation law has confirmed that, to his knowledge, this was the first time in a common law country that a court has permitted proceedings to be served via Instagram. The courts have previously allowed service of injunction notices via social media including Facebook and Twitter but this is the first time a full harassment injunction was served via social media. Serving court documents via Instagram requires specific preparations to ensure readability and the preservation of continuity of evidence. This particular court order specified that the injunction should be served both as text and as an image, which means it required creation of images of particularly high resolution that actually fit into the Instagram template. Discovering the identity of anonymous, online users could take time but in most cases is possible to smoke out harassing online users. Defamation solicitors Cohen Davis have so far brought to justice a number of anonymous online users, who posted defamation and harassment on the internet by bringing civil and criminal legal proceedings against them. Defamation solicitor hands online offender Paul Britton to the police and then sues for defamation! Our defamation solicitor says that if you already have sufficient information to take the poster of the defamation to court (for the poster of the defamation you will need the their full name and postal address) then the operator of the defamatory website might escape liability altogether even if they don't remove the offending posts. Unless they act with malice. Our defamation lawyers actively search for evidence of unlawful corroboration between review website operators and certain reviewers. If we find evidence that operators of review websites act dishonestly or negligently or with malice, our defamation lawyers will pursue both the operators and the posters of the defamation to your benefit. If the defamation against you was posted on a website that is located outside the UK and you are unable to obtain the full name and postal address of the poster, then depending on the country where the website is operating from, you will have a choice to use the defamatory website's local laws to facilitate the removal of the defamatory comments or still you will be able to pursue the same goal using UK laws. UK courts might extend their jurisdiction to countries outside of the UK. It is possible, says our defamation solicitor to obtain various UK court orders to direct website operators who are based outside of the UK to remove defamation from their website. Similar orders are available to direct those websites to provide you with personal information about the users who posted the defamation against you. So far, the vast majority of website operators who are located outside the UK have been hugely co-operative with our efforts to remove defamation from their websites. Our defamation solicitor notes that in some notable instances however they refuse to do so, in which cases we utilised our strong network of local specialists internet lawyers. There is a small number of high profile rough website operators, particularly in the USA whose websites are designed to encourage users to post defamatory comments against whoever they want. A good example of such website is the Ripoffreport which is laden with defamatory and inflammatory posts against innocent people. If the defamation against you is posted on one of these rough websites, our strategy is likely to focus on de-indexing (or de-listing) the defamatory web pages from Google, Bing and from other search engines which means the defamatory comments will no longer be visible to around 95% of internet users. If the defamation against you was first published after the first of January 2014 and you do not have sufficient identifying information about the poster of the defamation to enable you to take the matter up with them, then website operator will need to get you this information and if they can't then they might need to take the defamatory post down. This makes it difficult for posters of defamation on the internet to post defamation whilst concealing their identity. In the majority of cases a responsible UK based website operator will remove the defamatory comments shortly after receiving a properly written Notice of Complaint (Notice of Complaint Regulation 2 and section 5(6) (a) to (c) of the Defamation Act 2013). Upon receipt of the Notice of Complaint, to be able to successfully defend legal action for defamation, the operator must contact the poster within 2 business days and obtain their full name and postal address. If the operator is not able to obtain this information from the poster, they will have a choice of either removing the defamatory comment from their website or become liable for defamation. Naturally, most website operators choose to remove the defamatory post altogether rather than have to defend its truthfulness at court. If the website operator can provide you with the full name and postal address of the poster of the defamation against you, the operator will not be obliged to remove the defamatory post and will have a defence to legal action for defamation. In this case, our strategy will focus on compelling poster to remove the defamatory post. Regardless of whether the defamation on the internet was posted before or or after the commencement of the Defamation Act 2013, website operators who post defamation on their websites may find themselves liable for defamation in relation to defamatory comments the permit to be published. In the vast majority of cases if approached correctly, website operators who are based in the UK will remove defamatory comments published on their website. Unfortunately some UK website operators still operate under the misconception that they are entitled to continue to publish defamatory articles on their website as long as they are not taking part in the editing of the defamatory material. This error is common mostly among those who operate local and national review websites or online discussion forums. Our defamation solicitor tells us that you defamation lawyers need to take extra care to ensure they make it clear to website operators their legal obligations and of the extent of their liability towards an individual or an organisation that is being defamed on their website. Educational letters by your defamation solicitor can save you a lot of money in unnecessary defamation litigation. This in turn should result in faster removal of defamatory content from the internet and with great savings for you.